Halloween is always a fun time for kids of all ages! 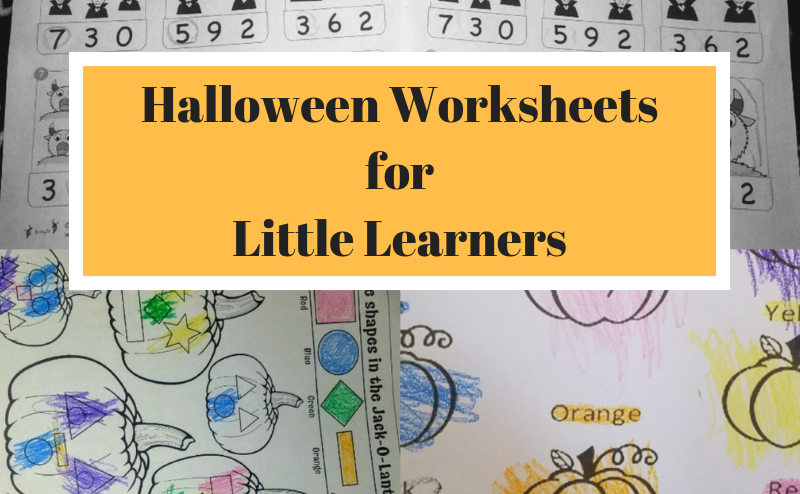 Here are some great Halloween learning resources for preschoolers and kindergartners! My kids absolutely love Halloween! They aren’t big candy eaters, but they love getting to wear costumes, walk around the neighbourhood at night and handing out candy. 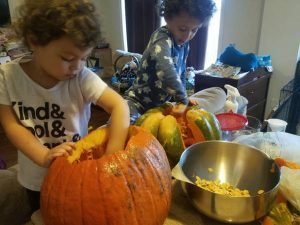 Of course, they also love the pre-Halloween festivities, including pumpkin patch visits, pumpkin decorating and carving and all the spooky fun. All the fun that surrounds Halloween makes it an easy theme for the end (or even all of) October. I took advantage of that to give the kids opportunities to develop their fine motor skills, along with their literacy and numeracy skill. 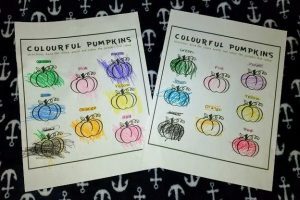 I created the Colourful Pumpkins sheet as a fun warm up activity for the kids. The night before they had been joking with their father about different coloured pumpkins, so I created something for them them to bring their fantasy to life. Both kids know their colours, which boosted their confidence for getting started with this, and while Nathaniel is a proficient reader, I am trying to encourage him to follow directions closer. So, under the the title I added an instruction note and had him read it to me, then tell me what he was to do in his own words. A simple step, but helpful for guiding him. Sophia, on the other hand, is still working on letter identification and sounds. So instead of having her read to me, I worked on phonetics with her. To do this, I simply sounded out each letter of each word and then repeated myself while increasing speed until she determined the word. Once she identified the colour word, she coloured it the appropriate colour and we went onto the next one. 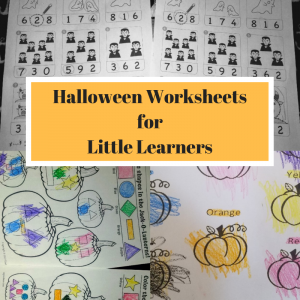 Click below to to get your free copy of the Colourful Pumpkins worksheet. I found this great worksheet while scrolling through Pinterest and decided to print it just for fun. 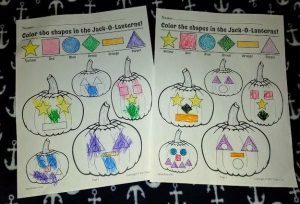 The big pumpkin at the bottom with circles inside triangles for eyes also gave the children an opportunity to utilize their executive functioning skills to plan for the best way to colour the eyes. Nathaniel (age 5) was able to notice the two different shapes and avoid colouring the circles (he lost interest when he got to circle colouring), whereas Sophia (age 3) did not notice. It also gave me an opportunity to occupy the older two while I put the baby down for a nap. In order to do this, I coloured the legend at the top for Sophia, so she could colour her shapes appropriately while I was distracted with the baby. You can get this worksheet by clicking the button below. Sophia absolutely loves the songs that Super Simple Songs has posted on their Youtube channel. So naturally, I was quite pleased when I discovered that they had developed a number of learning activities to go along with the songs. (I was also quite happy to find the songs on the website, to keep her off of Youtue). So it goes without saying that she was pretty pumped to get an activity sheet to go along with their “Five Creepy Spiders” song. Nathaniel rushed through the sheet, but it was a great way for Sophia to develop her one-to-one correspondence and number identification. 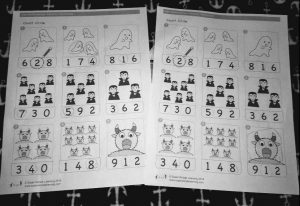 ​You can get the worksheet by clicking the button below.Get the Worksheet HereHere’s a little video of Sophia singing while counting the vampires. She did this for each creature on the sheet. Seriously, how adorable is she?!? !